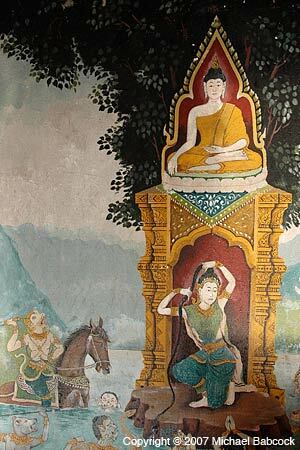 This mural of the Earth Mother Goddess is found at one of my favorite temples in Thailand – Doi Suthep in Chiang Mai (see Doi Suthep Buddha). You may recall the statue of the Earth Mother Goddess, Ubon Ratchathani from last December. This mural is found in one of the temples at Doi Suthep. I’ve related the story of the picture in my previous post: the short version is that as the Earth Mother Goddess bore witness to the Buddha’s enlightenment, she wrung the water from her hair and the flood swept all the illusions (personified by Mara) away. There seems to be much confusion and misinformation in western culinary publications and in the food pages of major newspapers about the alleged culinary use of betel leaf, called bai plu in Thai and Lao; bai = leaf, plu = name of the leaf. 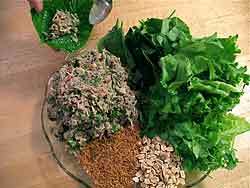 We do not use it in Thai cuisine and it’s wrong to say that it is the leaf used to wrap a common Thai snack called miang kam. 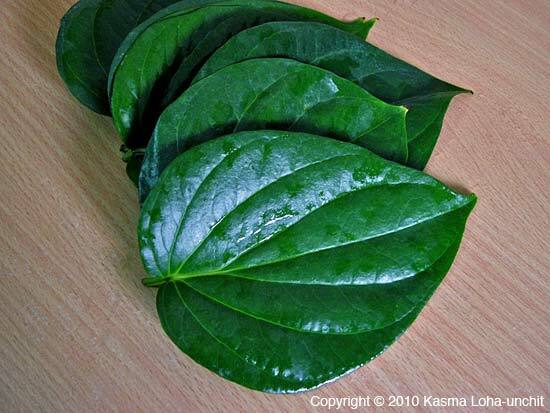 In most of Southeast Asia, the betel leaf is used largely for the chewing of areca nut (erroneously called “betel nut” by colonialists) and as a medicinal herb. It has a very intense taste – bitter, hot, and unpleasantly medicinal – and can numb the tongue. 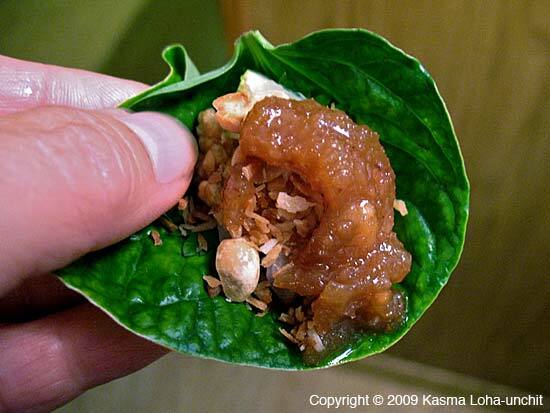 Such a strongly flavored leaf would be far from the leaf of choice among sensible cooks for wrapping the tasty tidbits in miang kam; It would only ruin the intricate balance of flavors of such a delightful Thai snack. The leaf used in wrapping miang kam is instead the “wild pepper leaf” – bai cha plu in Thai and Lao. Like the betel leaf, it is a member of the pepper genus (botanically, “Piper”) and. therefore, the two are related but far from being the same, just as lemons and oranges are different fruits though both are citrus. 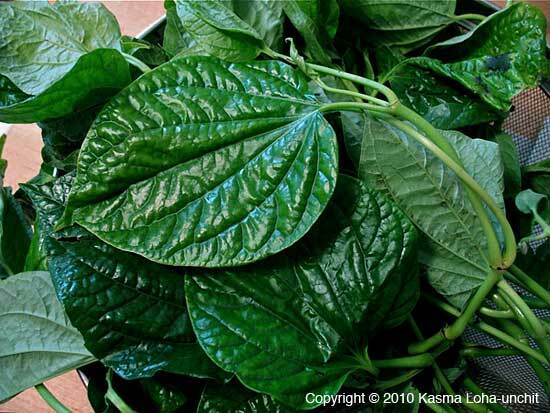 The botanical name of betel leaf is “Piper betel,” often spelled “Piper betle,” which gives it its common name, whereas the edible leaf with culinary uses is “Piper sarmentosum”. 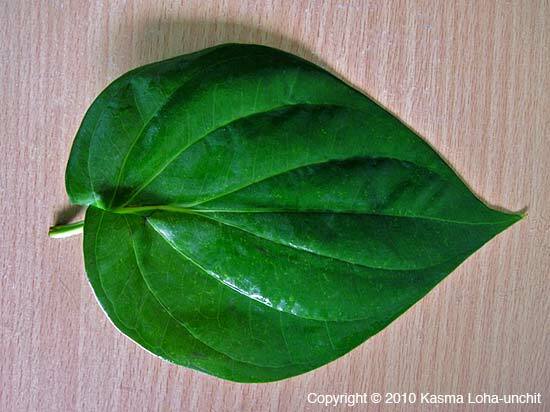 It would be more accurate to call the latter “wild pepper leaf” rather than “wild betel leaf” as it is sometimes called (again wrongly just as is the case with areca nut) since it has little to do with “betel” other than being in the same large “Piper” family with many other prominent relatives. Doing so only confuses aspiring cooks interested in learning to prepare Thai, Lao and Cambodian cuisines who end up buying the wrong leaf to use. Plu or “betel” is a woody evergreen vine that prefers growing on high ground since it dislikes wet soils, whereas cha plu is a herbaceous creeper that naturally grows along streams in lowland forests, preferring damp soils. This difference already sets the two plants a world apart. Besides, I believe the origins of the two differ – “betel” is native to India, Bangladesh and Sri Lanka, whereas cha plu‘s home is the tropical heartland of Southeast Asia. The reason for the confusion between the two, aside from the improper naming by western sources, stems from the similar shape and color of the leaves and the difficulty of telling which is which from a distance. Both have large, glossy, deep green, heart-shaped leaves. But when the two are placed side by side, the differences are apparent. bai plu is much larger, thicker, tougher and more leathery with a smoother appearance, while bai cha plu is thinner, more tender and has much more veining in-between the main vertical lines giving it a crinkly appearance (see pictures below for comparison). 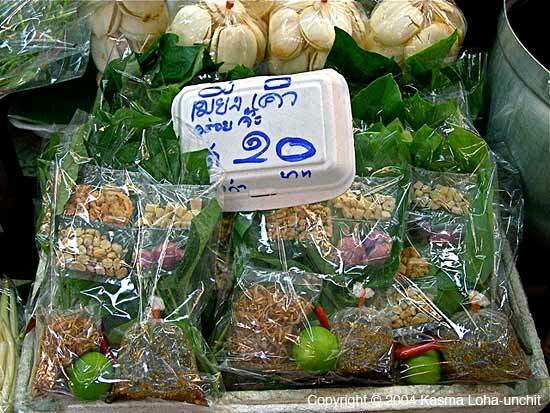 Because of their similar appearance, even some Thais can confuse one for the other if shown just one leaf. 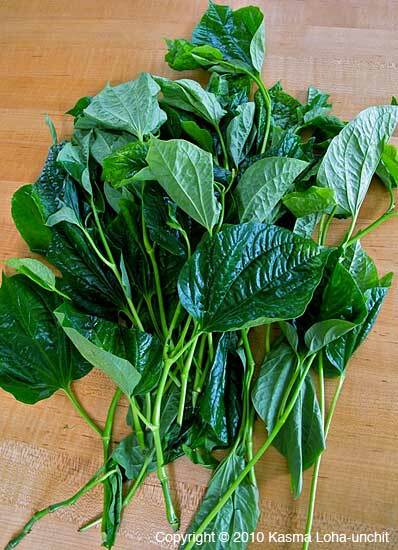 For this reason and the way it is cultivated and harvested, bai plu or betel leaf is almost always sold as single leaves, occasionally bundled together with a strip of the outer covering of banana stem. 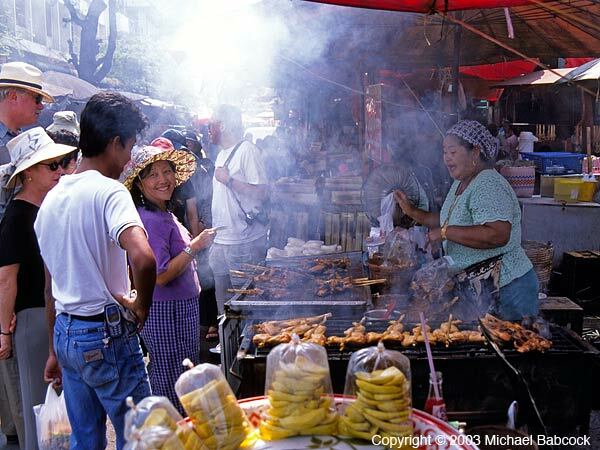 In fresh, open-air marketplaces in Thailand, it is usually found in the “smoke shop” – i.e., the stall that sells fresh or dried areca nuts and tobacco. Seldom is it ever found among vegetables at fresh produce stalls. 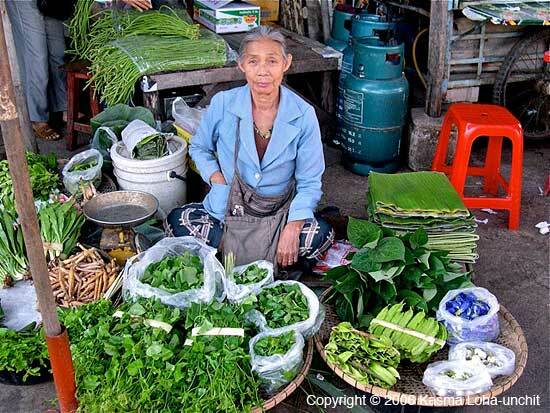 Bai cha plu, on the other hand, is always sold still attached to a stem in the company of several other leaves and is sold in bunches alongside other vegetables (see picture, below, of vegetable stall in Sukhothai market). In the San Francisco Bay Area, the two leaves are sold in a similar fashion as above. Betel leaves can be found in single leaves in a large bag, usually near dried areca nuts (yes, there are Southeast Asian immigrants here who still chew them as a stimulant) or the checkout stand and you can buy one or as many leaves as you wish, while “wild pepper leaves” are sold still attached to stems (usually the terminal ends of young vines) and most often, already packaged in plastic bags. 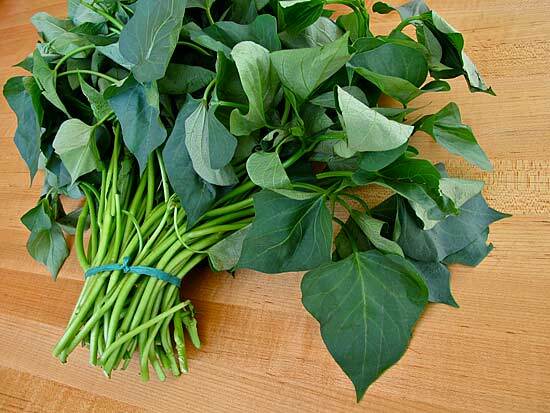 At $7 to $20 a pound, depending on availability, it’s hard to confuse it with a common and much cheaper summer vegetable (a kind of sweet potato leaves – see picture, above) which comes in large bunches with similar-shaped but thinner, smaller and non-shiny leaves at 99 cents a pound. 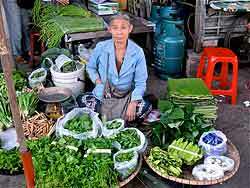 The Thai name cha plu is a recognizable one to Lao and Cambodian shopkeepers, so you can ask them to verify whether you are buying the right leaves. In the East (San Francisco) Bay where I live, I have no trouble finding cha plu in three Oakland stores during the warmer months of the year – Sontepheap on International Blvd. and 14th Ave, Sun Hop Fat on East 12th Street at 5th Ave, and occasionally bulk at the Laos International Market on International between 16th and 17th Aves. During the winter and early spring when the weather is still quite cold, this tropical vegetable may be hard to come by and has to be shipped in from Hawaii. 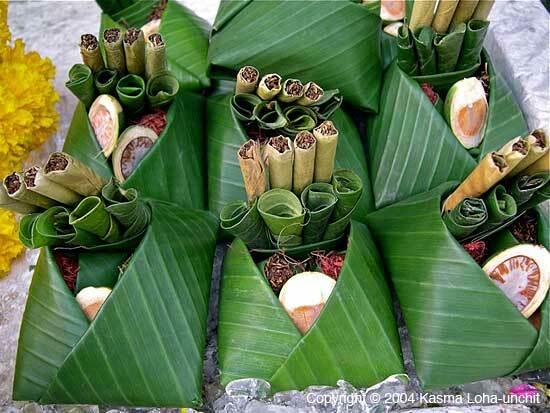 Bai cha plu has become so closely associated with Miang Kam that among Thais it is frequently given the nickname bai miang (bai = leaf), although another tasty, large and fairly thick, oblong leaf called bai tonglang is also used for this snack. The latter, however, is now rarely available as fewer growers cultivate it. Besides Miang Kam, cha plu accompanies many kinds of spicy salads as a wrapper since its size, resilience and peppery flavor make it a good leaf for this purpose. Among them is the delicious and fiery hot yum sadet pictured here from Reun Mai restaurant in Krabi – a mixture of shrimp, fried cashews, fried dried cuttlefish, chopped ginger, lemon grass, Thai chillies, chopped lime with peel, shredded green mango and other ingredients that combine perfectly to set off the fuse for a big explosion of flavor in the mouth, the bai cha plu adding both flavor and texture. 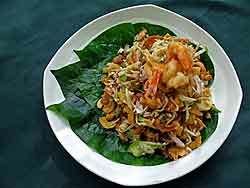 Another salad pictured here – Miang Takrai (Lemongrass Miang) – comes from the charming Sudapon restaurant in Trang – a sweet-and-sour combination of myriad chopped ingredients and featuring thinly sliced lemon grass and sweet shredded dried pork. 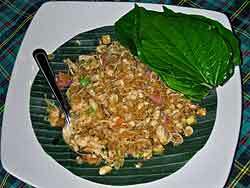 There are other miang’s, too, that sometimes use bai cha plu as one of the leaves for wrapping, such as the miang bplah tu shown below from one of my classes, consisting of a tossed salad of finely shredded cooked “bplah tu” (a favorite, small mackerel plentiful in the Gulf of Thailand), slivered ginger, sliced lemon grass, sawtooth coriander, green onions, and a hot-and-sour dressing made with chopped Thai chillies and lime juice, to be wrapped in a leaf (either bai cha plu or lettuce) along with toasted shredded coconut, roasted peanuts and cilantro. Indeed a delicious combination! and a complete meal in itself served chilled on a hot summer day! Bai cha plu is also shredded up as one of the vegetables in southern Thailand’s well-loved rice salad (kao yum) and cooked in whole leaves as a vegetable in pungent curries with chicken, shrimp or snails, where the leaves impart a distinctive flavor and aroma. cha plu is loaded with antioxidants and recent research indicates that it is protective against several kinds of cancer, including cancer of the lungs throat, stomach, intestines and bladder. It is rich in beta-carotenes, which the body can convert into valuable vitamin A if eaten along with good fats needed to store and transport this fat-soluble vitamin. In the case of a curry, the coconut milk provides the necessary fat. bai cha plu, however, does contain a fair amount of oxalates, which need to be offset by eating it with sufficient protein such as the seafood or other meats in a curry, and by drinking lots of water to flush out the oxalates from the body. As for betel leaf, I know of no culinary use for this strong-tasting leaf with known stimulant qualities. Some sources here in the Bay Area say the Vietnamese use it for wrapping meats for grilling, but when I ask recent immigrants from Vietnam, I am told the leaf used for this purpose is not the betel leaf, but the “wild pepper leaf”. They all tell me that betel leaf is only used for the chewing of areca nut and for medicinal purposes and that it is much too strong and stimulating for consuming as a vegetable. In fact, a Cambodian friend told me recently that he once ate a betel leaf and it kept him frazzled most of the day! 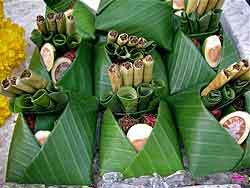 In wrapping areca nut for chewing, the betel leaf is not ingested, but spitted out. Betel leaf is a stimulant and so is areca nut, but the stimulant property of both is absorbed through the blood vessels lining the inside of the mouth and not through the digestive tract. Although it has many medicinal benefits and is used in age-old Ayurvedic medicine in India, the unusually higher rate of oral cancer among people who chew “betel nut” has led some scientists to speculate that the betel leaf might possibly be the culprit. In the absence of further studies to prove or disprove this suspicion, it would be prudent to be cautious and avoid eating the betel leaf as a substitute for the nutritious “bai chaplu”. There’s no telling whether it might contribute to the risk of other cancers if it is ingested. 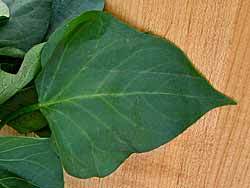 In a Thai-language book about 108 myriad Thai vegetables (the number 108 is often used to describe plentiful abundance in varieties), the author is quick to point out that the flavorful bai cha plu with all its wonderful nutritional properties, “often feels horribly slighted” by people who erroneously identify it as betel leaf. Somehow in the West, culinary personalities, like the colonialists before them, are confused. Just as the areca nut has been “slighted” for centuries by being called “betel nut”, the “wild pepper leaf” is likewise being misunderstood as if it is the “betel” leaf. Why is it that the West has such a romanticized notion of the word “betel”? Written by Kasma Loha-unchit, July 2010. I like this picture of Kasma about to buy some barbecue chicken in Nakhon Pathom. It gives a bit of the sense of how crowded these markets can get and how hot, with the steaming chicken under a characteristic umbrella (barely visible at the top). I went back into the archives for this one: it was originally taken as a slide back in 2003 and converted to digital by scanning the slide. 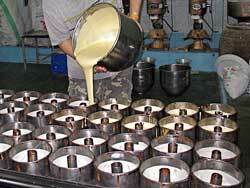 You may have heard of Trang cakes. Trang, a city in Southern Thailand, is a kind of crossroads city for Nakhon Si Thammarat, Krabi and points further south, including many of the islands in Trang province. If you’ve spent any time in Trang you probably noticed the stacks of square boxes at various food stores and wondered what they were. 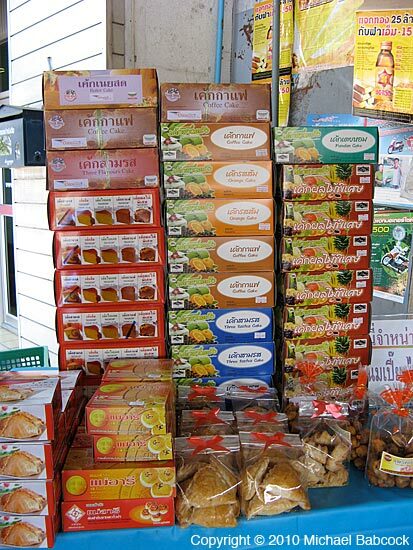 The boxes contain a type of cake called Trang Cake and they are one of the food items that Trang is known for. Another is pork that is roasted in a particular way. There’s even a Cake festival in August. A Thai traveling around the country usually plans to stock up on food items that a particular town or locale is known for, such as salted eggs in Chaiya. 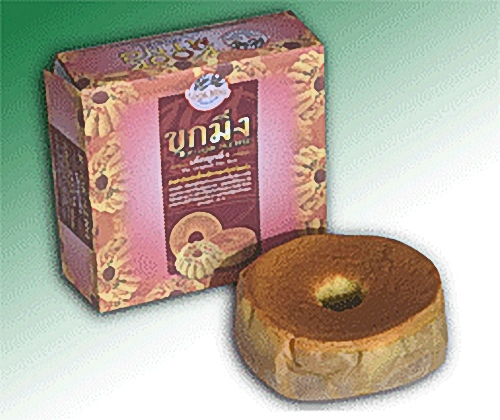 Travelers to Trang will often pick up several Trang cakes to take home as gifts. 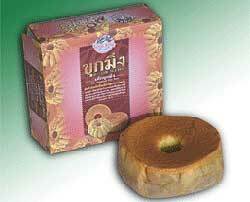 On her trip to Southern Thailand I look forward to Trang, because we’ll get to have Trang cake for several days. Kasma always picks up a couple to take to the staff at our favorite restaurant, Ruen Mai in Krabi. 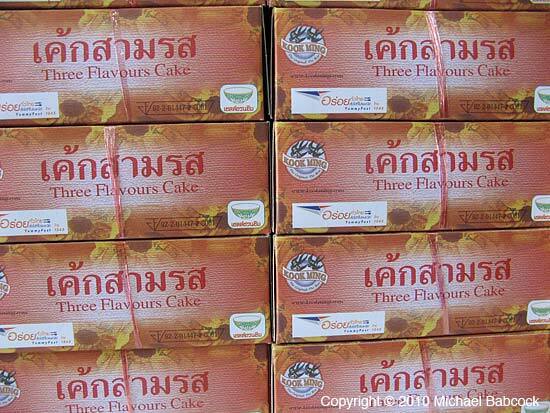 When buying a Trang cake you want to make very sure that you buy the correct one. The one Kasma and I recommend, and the only one we can, in conscience, recommend, is that made by Kook Ming. Their motto is: “The Original – The Best” and you should look for the logo, which has two black birds flying over the name and the motto. 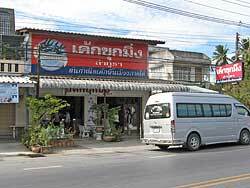 When asking for them, you can also specify “Kook Ming, the cake from Lampura.” On the trips, we pick them up from a kanom store in town (see first picture to upper left). The one time that Kook Ming cake was not available (it is popular and can sell out), we tried another brand and found it to be nowhere near as delicious. 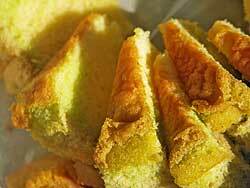 Although you can buy the cakes in Trang town, I recommend an excursion to the bakery itself. 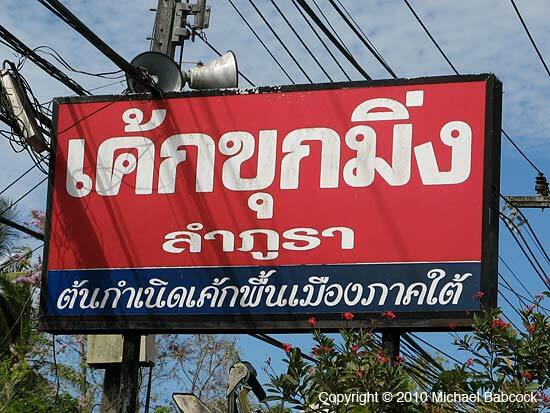 Simply head north on Highway 4 towards Krabi. Lampura is roughly 14 km from Trang in the district of Huai Yot. The bakery will be on your left as you head north. Kook Ming cake is very much like a sponge cake. It is light and bouncy with good flavor. 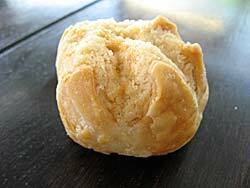 They make it without preservatives of any kind and no baking soda but with plenty of eggs and shortening. Their website lists 10 different flavors. My favorites are the kehk som (orange cake), kehk dteuy hawm (pandan leaf cake), kehk neuy sod (butter cake) and the kehk sahm roht (three flavors cake, the three flavors being orange, coffee and plain). In addition to the standard cakes in the large square boxes, they also sell cakes that are similar to jelly rolls, rolled up with frosting and sold is smaller, rectangular boxes (see picture to right, below); I’ve only seen these jelly-roll cakes sold at the bakery. The story of the bakery is that of a rags-to-riches Chinese immigrant to Thailand with the name of Kook Ming. Born on the island of Hainan off the southern coast of China in 1916, he was sent by his parents to Thailand when he was 18 (an elder brother was already there) because of the great unrest and fighting with the Japanese. He originally lived in Narathiwat province, where he worked at a series of odd jobs, mostly manual labor; he earned 7 baht a month. After a year he moved to Hat Yai, where he began working for a distributor of soft drinks for 12 baht a month. A hard, diligent worker, after three years he was made a regional manager and sent to Trang district with the magnificent salary of 25 baht a month. After a time, Kook Ming took a liking to the cross roads town of Lampura, 15 km from Trang; he moved there and opened a small coffee shop to serve locals and travelers through the town. He bought the coffee beans and roasted them himself and served the coffee along with a number of snacks; his wife made fried bread, a type of dumpling called sara bow and curry puffs and they supplemented these with kanom from elsewhere. 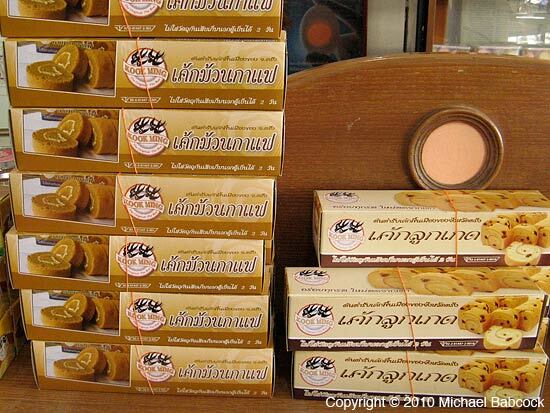 One of these kanom was a European-style cake: Kook Ming would bicycle the 14 kilometers into Trang in the early morning to purchase the cakes. His patrons, however, did not care for the cake, which had a frosting, so Kook Ming decided to come up with a good cake recipe that would better suit the local tastes. He made a stove out of a 200 liter oil drum and began experimenting. He also invented an appliance to beat eggs. He was having difficulty getting the cake to cook evenly so he invented a type of pan with a hole in the center, much like a plain bundt pan. He then spent a fair amount of time perfecting his recipe. Once he mastered the recipe his cakes became very popular and the popularity began to spread. As the demand grew, customers wanted to buy cakes to take home, so he began selling them in the square boxes. A break came in 1960 when an group of men on a electricity commision travelled through and loved the cake. One of the men recommended the bakery to an agency that gives a seal of approval to certain restaurants and food stands, recognized by the logo of a green bowl (which can be seen on the side of the cake box). 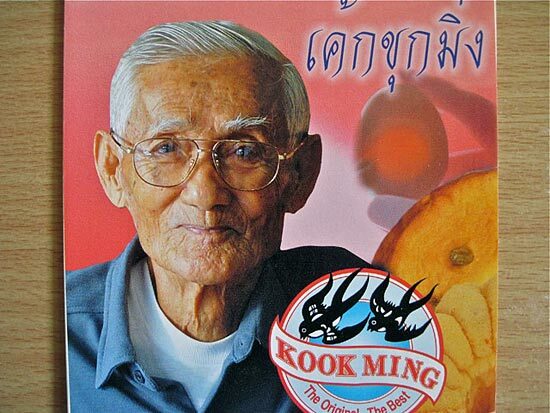 The delicious cakes became more widely known and at one point Kook Ming was the guest on a popular television game show that spread his fame even wider. The Kook Ming website (completely in Thai, unfortunately) has many pictures of celebrities who have visited the store and a couple from the game show. The bakery continues to flourish, run now by his daughter, who came up with recipes for many of the different flavored cakes. Kook Ming died in 2004. 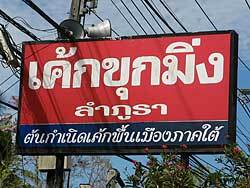 In Thailand, as elsewhere, the sincerest form of flattery is imitation. 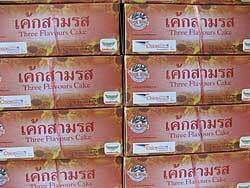 I’ve counted at least another half dozen brands of Trang cakes; but this was the first and is still, as they say, the best. More than once when we’ve stopped at the bakery to have cake and coffee and to stock up for the ride north, there have been tour busses that have stopped – nearly all of the people on the bus were buying cakes, often several boxes. Aside from a chance to see where the cakes are made (in a clean, modern bakery in the back of the store – they’ve long outgrown the 200 liter oil drum! 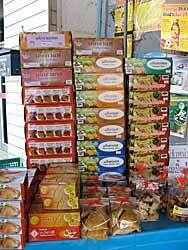 ), their store in front still offers a number of other delicious treats that are made on the premises. I’ve included pictures of two of my favorites. The first is a curry puff, a flakey outside with delicious chicken curry on the inside – garee pahf sai gkai. 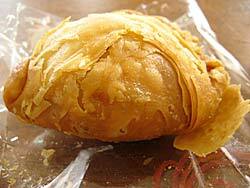 They also make a pastry filled with sangkaya, a rich egg custard. The second is a substantial, tasty cookie, very crunchy. Their website contains several pictures of other snacks that are made on the premises. Written by Michael Babcock, July 2010. 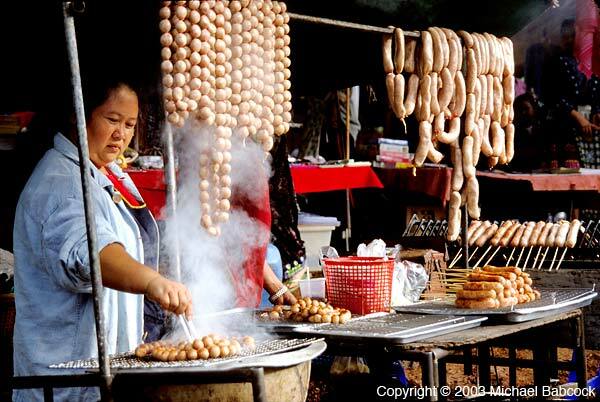 This is a photo of a Hmong woman grilling sour sausage (a subject dear to my heart!) at a Hmong New Year’s celebration in 2003 in a village north of Chiang Mai. The other day I was musing on the rise of digital cameras leading to the nearly total eclipse of film cameras and waxing a bit nostalgic. As recently as 2003 Kasma and I were still shooting slides and spending several hundred dollars a year on slide film, developing and printing pictures. Now we’re 100% digital. Some days I fantasize about digitizing at least some of the approximately 20,000 slides we have. One of these days. Perhaps. This picture is posted here In honor of those days gone past, The camera was a Nikon N80, long may it rest in peace! Here’s another Sausage Vendor (in Ayuthaya). This picture of a smiling vendor selling grilled sticky rice was taken in the morning market at Loei. 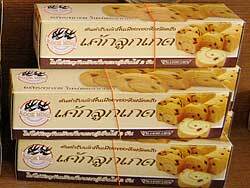 I’ve seen it sold at a street stall on Sukhumvit Road at Soi 55 (Thong Lo); presumably the vendor is from Isaan. 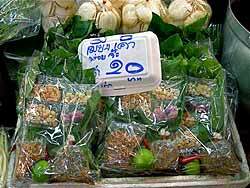 In Northeastern Thailand (Isaan or Isahn) the preferred rice is Sticky rice. For most meals it’s served in small baskets and one dips the hand directly in the basket and rolls the rice into a ball for eating. 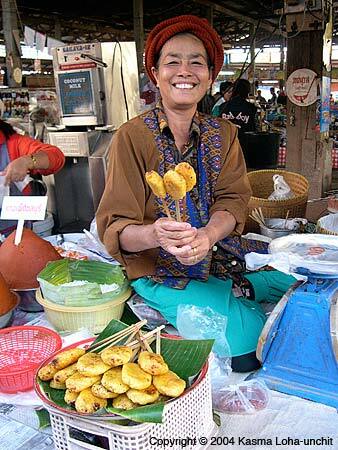 This picture shows another alternative, seen is most Isaan markets is a crispy grilled sticky rice, on a stick. It’s really quite delicious, typically dipped in a mixture of beaten eggs, salt and pepper and then grilled until golden brown and lightly charred and crispy. In Thai it is called kao jee; Kasma calls it Northeastern-Style Crispy Grilled Sticky Rice. 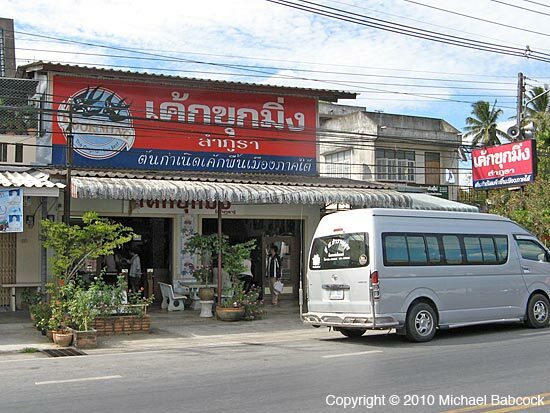 You are currently browsing the Thai Food and Travel Blog blog archives for July, 2010.